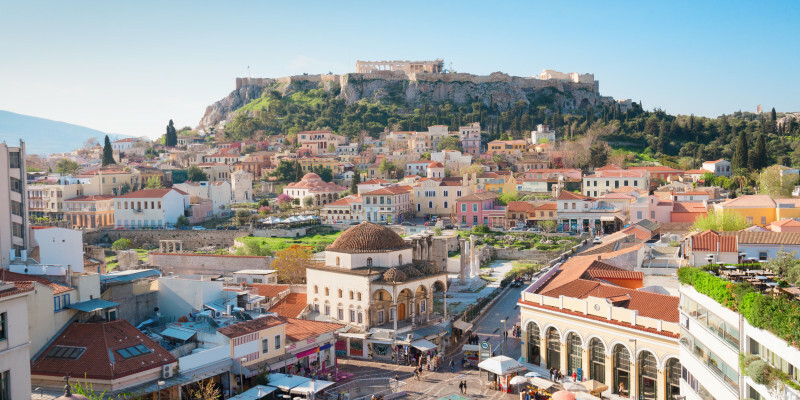 Athens is the birthplace of Democracy, the place where philosophy flourished, the city that hosts the renowned Acropolis and the modern center of Greece’s financial and cultural life. In addition to its immense historical importance, the city of Athens has countless beauties and activities to show, leaving all visitors enchanted. It’s early in the morning and the sun shines over the neighborhoods of the city as we begin our tour in one of the most important cities of Europe. First stop? The Acropolis of course! We take the subway and exit at the pedestrian street of Dionysiou Aeropagitou, making a short stop at one of the countless cafes to enjoy a morning cup of coffee and get ready for our day. Then, we take a stroll in the huge pedestrian street, enjoying the local street musicians and heading to the Acropolis Museum. Its visitors can walk around its many galleries (The Gallery of the Slopes of the Acropolis, The Archaic Acropolis Gallery, The Parthenon Gallery, the Propylaia, Athena Nike, Erechtheion, 5th century BC – 5th century AD) and admire all the findings from the archeological site of Acropolis. The sloping glass floor allows visitors to see the entire archaeological dig. If you look closely, you will notice that the floor has a slightly rising inclination, reflecting the walk up to the Acropolis. And yes, of course we will walk up to the Acropolis! In the early morning, when the sun is not too hot yet and with a cool breeze easing the way up, we reach the most renowned, most historical and most important location in Athens and beyond. This wonder of historicity and architecture is sure to strike a chord with all its visitors. Noon has come and we’re right on time to enjoy a meal in Plaka! No matter what tavern you choose, you are sure to enjoy a wonderful meal and have a great time. We recommend visiting Anafiotika, offering Mediterranean cuisine and vegetarian dishes, right in the heart of Plaka. Now that we’re rested and rejuvenated, we continue our walk towards Syntagma. This is where the heart of Athens beats. Enjoy shopping at the city’s central marketplace, Ermou Street, and then head towards the University. Right next to it you can see the wonderful building that hosted the National Library until recently, and on the opposite side of the street you will find the University Club at Ippokratous Str., and the “Irida” cinema where free courses on photography and cinema are taught each afternoon, organized by the students and open to any art lover! We have discussions, exchange views and continue our walk, enjoying a souvlaki from the “Brizolakia” tavern at Akadimias Str. Following your downtown stroll, feel free to use any of the public transportation means and head to the beach! Marina Flisvou is very close to the city center and you can enjoy dinner in one of the restaurants operating at the Park and relax, listening to the waves breaking at the marina. Athens has a lot to offer to its guests and one day only gives you a short taste – so until we take another stroll, get plenty of rest and be ready for your next adventure!